Short on counter space, but love the idea of making a latte or cappuccino in your very own home? Let us introduce you to our new little friend – the Capresso EC PRO! Small in size, but not short on essentials, this machine has everything you need to brew a satisfying shot of espresso or delightful latte. Pump Boiler System - Keeps water at optimal temperature for when you are ready to brew. Cup Warmer - Use the integrated cup warmer to heat your cups prior to brewing. Powerful Frother - Create rich and foamy milk based drinks with this impressive frother. Removable Water Tank - The 42 oz. water tank is portable for easy filling. Portafilter Options - Users can enjoy making espresso with either the standard double spout or a bottomless version. Small Footprint - Being short on space shouldn’t stop you from creating the coffee you love! While small in stature, this machine features all the essentials for creating your perfect drink. 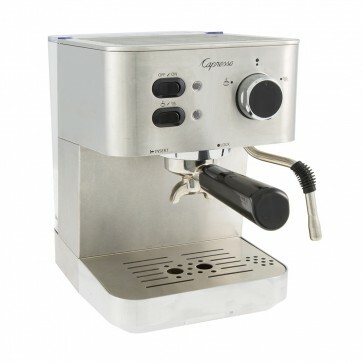 Easy to Use - Sticking to the essentials and offering easy to understand indicator lights, simple espresso/steam selector dial, as well as on/off and espresso/steam switch makes this machine easy to operate no matter your skill level! Accessories - This machine comes with two portafilter options plus a combined tamper and coffee scoop. Slow Warmer - If you like pre-heated cups, be sure to allow your machine ample time to heat. Steam Wand Clearance - Purge your steam wand in a cup or milk frother, as this machine lacks excess clearance . This machine has comparable functionality to the EC100, but with a more modern, sleeker look. Clean the brew gasket with a cleaning brush daily. Wipe frothing wand with a damp cloth after each use.